During the Summer Your Hair is very sensitive and exposed to atmospheric conditions and high temperatures, that’s why she need a special summer care. UV radiation, perspiration, chlorine from swimming pools, dust , daily washing and styling has very negative influence on look and health of your hair. If we try to avoid these factors than we can not to enjoy in all charms of summer , but proper care can lessen their negative impact . 1 . Whenever you have chance to protect your hair from direct sunlight protect her with hat , they are perfect solution . Hat will give you attractive look and beside that will protect your face skin too .If you don’t like to wear hats, there are scarves and of course sun protect products that are applied before sun exposure hair. These products are designed to act as a filter UV rays. They protect the hair pigment and also keep your hair from drying out and cracking. 2 . During the summer your hair is very dry that’s why you need to hydrate hair with adequate hair mask . Nutritious package would be advisable to apply at least once a week, and conditioner after every wash to prevent tangling of hair. You can also make your own hand made masks for hair. 3 . If you notice that your hair is dry, avoid harsh shampoos over the summer. Shampoos without sulfates are ideal for washing your hair during the summer months because they have a mild composition. You can use them only if your hair it’s not too much oily. 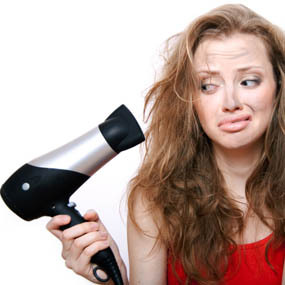 Avoid blow-drying when temperatures are high. On warm summer days you don’t need to open your hair therefore make a beautiful braids or pick up your hair high up in elegant ponytail .